At Turner Timber, we offer a range of 4 different wall options, with something to suit every project and requirement. We are also able to work with you to create a bespoke wall build up ie Breathable, increased depth, twin stud, or metal web. All our high performance wall panels are precision manufactured to exacting standards from the same top quality, sustainably sourced, kiln dried vac vac treated CLS timber. Designed to be able to meet and beat all current building regulations, the frames provide plenty of space for insulation, and come together to create the strong, thermally efficient structure for your build. The walls to your home can come either Pre insulated or left for you to fit your own insulation. By far our most popular option, save time and money with precision factory fitted insulation, we use brand leading PIR insulation such as Kingspan, Rectocell or Ecotherm to ensure you receive the most thermally efficient home. 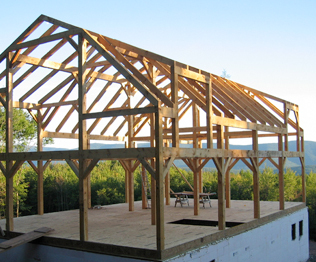 Our standard package is our most cost-effective timber frame. Strong, sturdy and dependable, it’s a tried and tested product that will beat all current building regulations. When pre insulated with our 120mm PIR insulation you can achieve a thermal efficiency U-value of 0.22, it compares favourably with traditionally built block and build structures. Walls in our plus packages feature an enhanced specification, including high performance ‘Protect’ vapour control foil with a service cavity. This creates a reflective air gap to act as extra insulation, whilst providing a zone to save you time and effort when installing pipes and wires. Our plus walling comes with an enhanced U-value of 0.20, offering improved thermal efficiency over our standard product. The advanced wall is our most popular product, and features a high specification foil breather membrane with metallised, low-emissivity surface for maximum thermal efficiency and performance. This high performance aluminium membrane reflects heat, keeping your home warm in winter and comfortably cool during the summer months. With a U-value of 0.17, it’s extremely efficient and will keep your heating costs to a minimum. Our premier, super advanced walling always comes pre-insulated with 120mm PIR high thermal insulation boards from leading brands including Kingspan, Celotex, Recticel and Ecotherm on top of this we add an additional layer of 25mm insulation to the inner face of the external walls. Designed to provide maximum convenience and thermal performance, reduced thermal bridge, increased air efficiency, they feature an incredible U-value of just 0.15 – making for an amazingly energy efficient building with incredibly low heating costs. Our expert team of timber specialists are here to help. If you’d like further information about any of our timber walls, or assistance in choosing the right specification product for your next self-build, call us on 01482 218945 today or fill out a contact form.